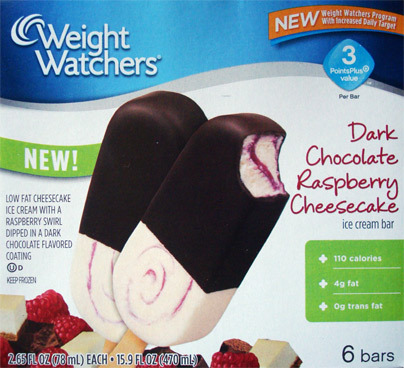 [By Nick] On my quest to add variety without adding on pounds, I’m led to try out the Dark Chocolate Raspberry Cheesecake Ice Cream Bar from Weight Watchers. I think I just burned some extra calories typing out the name of this product alone. Now I’m a big fan of raspberries and you already know my feelings about cheesecake, so when I saw these bars I knew I had to give them a try. Weight Watchers describes them as “low fat cheesecake ice cream with a raspberry swirl dipped in a dark chocolate flavored coating”. Low fat cheesecake has to be one of the best oxymorons I’ve seen in a while. It seems as though they’re using the same dark chocolate shell that covers the Dulce de Leche bars as well. As expected, the shell is identical to the dulce bar. It has that nice dark chocolate profile while adding texture to the bar. Unlike my experience with skinny cow, I was actually able to taste something reminiscent of cheesecake in the ice cream. The cheesecake flavor is mild but still presents itself with a slighty tangy bite. This cheesiness pairs itself perfectly with the tart raspberry swirl that’s throughout the bar. The ice cream itself was fairly creamy for a low fat product. There’s not much more I can mention about this bar other than it’s a well put together treat. For the nutritional crowd, this bar only has 110 calories with 35 of them coming from fat. For a bar with only 4 grams of fat, it sure doesn’t taste like it. Eating this bar is a nice way to feel like you’re treating yourself to something that is bad for you. In reality, it’s one of the smarter choices in the ice cream aisle.